Mayo Clinic team members are known for their caring spirit, and the four-legged members are no exception. That's why Mayo's Caring Canines dog therapy program is often exactly what the doctor orders. There were many faces in the crowd waiting for ice cream at Thursdays on First, Rochester's summertime market and music festival. But Beau only had eyes for one of them. Then just a year old, Beau walked up to a woman in a wheelchair and laid his head on her feet. "He looked up at her, pretty much asking her to pet him," Salma Bydon says of Beau, her Portuguese water dog. "Everyone in line for ice cream laughed." Including the woman in the wheelchair, who was in Rochester — and away from her own beloved pets — to receive treatment at Mayo Clinic. "Beau's affection was a good dose of a different kind of medicine," Salma says. "The fact that Beau went up to this patient, confidently but gently, showed me he had a special gift." 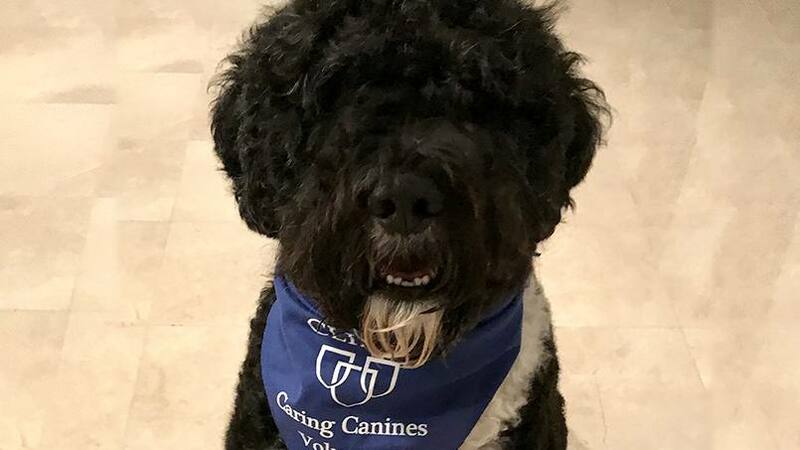 Salma's husband, Mohamad Bydon, M.D., a neurologic surgeon at Mayo Clinic, agreed, and the couple decided to take Beau through training to become part of Mayo Clinic's Caring Canines Therapy Dog program. Around 100 teams of dogs and owners are part of the program, visiting with patients at Mayo Clinic's Rochester, Arizona and Florida campuses. The four-legged team members selected for the program all have much in common with Beau. "The best therapy dogs are those that enjoy strangers as much as their own family," Jessica Smidt, coordinator of the Caring Canines program, tells us. "They should be obedient and calm, but mostly affectionate and affiliative. The ones who snuggle up with patients, lean into them and look endearingly into their eyes make the patients feel the best." Lilly and Strudel fit that bill. The dogs — a yellow lab and German shorthair pointer — visit with Mayo Clinic patients several times a week with their handler, Charlie Waite. "Every visit, something good comes out of it," Charlie tells us. Sometimes it's "easy and obvious" to see that good. "You have a kid sobbing, afraid of tests. You walk into a room with a dog and the kid calms down," Charlie says. Other times, the impact isn't as clear. "We visit patients who don't talk to me at all. But it's important for someone to be there." And sometimes the best "someone" has four legs and fur. "Dogs are great listeners and will sit quietly as someone hugs them and cries on their shoulder," Smidt says. "They don't judge or offer an opinion. They also provide a distraction from a patient's diagnosis and reason for their hospital stay." Mayo Clinic believes so strongly in the power of pets that providers can order visits from a therapy dog, just as they would order physical therapy or other medical services. But much of the (ahem) dog-toring at Mayo takes place less formally. "Just walking through the halls with a dog makes people smile," Charlie says. And that makes him smile as well. "I do this because I'm incredibly selfish," Charlie says of the time he spends volunteering with Caring Canines. "It's the secret of life. To be happy, do for others." If you'd like to do for others by volunteering with the program, you can learn more here. Then make us smile by leaving a comment below before using the handy social media tools atop this page to share this story with others. 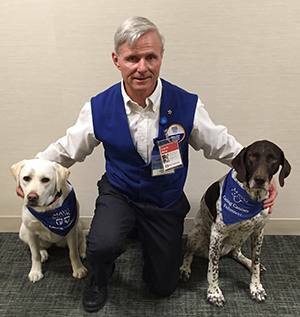 Read more about Mayo Clinic's Caring Canines volunteer service.